The Promenade Hotel located in the heart of Kota Kinabalu. 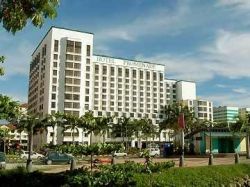 The large hotel is within walking distance from the shopping centers, restaurants, and the business district. The guest rooms are well designed with charming décor and with a beautiful view of the Sea. This hotel provides excellent value for money for golfers.